“Gene Spafford receives this award in recognition of his significant and long-term contribution to the field of information security in research, education and promotion. He has provided academic leadership in the field of information security and assurance, through the formation of the Computer Operations, Audit, and Security Technology research laboratory, and later direction of the Center for Education and Research in Information Assurance and Security (CERIAS). He has also made extensive contribution to security literature, both through his own books and articles, as well as his roles Academic Editor and Editor-in-Chief of Computers & Security, the oldest journal in the field of information security. 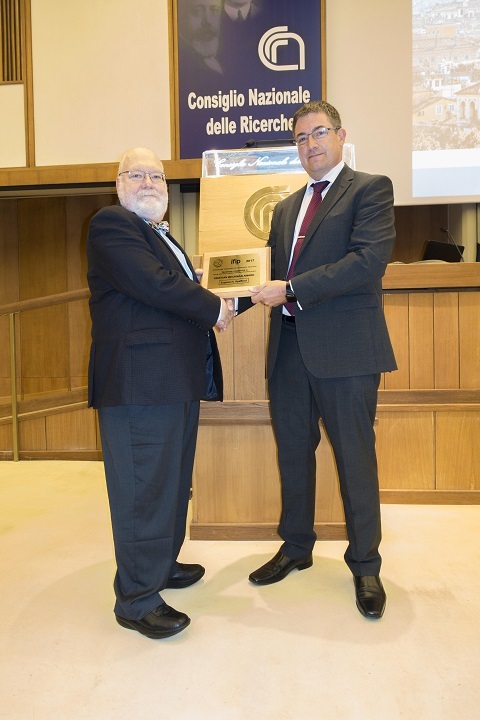 His work has had a positive impact upon security practitioners through the development of tools that have been used world-wide to assist the management of system security.” Gene accepted the award, and delivered a keynote talk entitled “Reflections on the state of cyber security”, at the award session during the IFIP SEC 2017 conference in Rome in May 2017. Gene Spafford and Steven Furnell during the 2017 IFIP TC-11 Kristian Beckman Award ceremony.